This page is available for Rochford Lodges to share and publicise their News. Please e-mail your items to Ian Whitley or send them by post. I regret to advise that I have ben informed of the sad passing of W.Bro. Fred Round by his sister, Jill. Fred was 79 years old when he died on 6th August, 2018. His funeral will take place at Weston-super-Mare Crematorium on 31st August at 12.30. Anybody who wishes to go, please let me know and I can inform his sister. Fred moved down to Weston-super-Mare, Somerset to be near his sister after his beloved wife Jean died. He was initiated into Ashingdon Lodge on 12th May, 1984, he was W.M. in 1995 and was Director of Ceremonies from 2002 to 2003, Assistant Director of Ceremonies from 2000-2002, Chaplain 2005-2006 and Almoner 1998-1999. He was made an Honorary member on 9th May, 2015. I will give our Almoner details of his sisters address so we can send our condolences. Fred was a true gentleman. a good Mason and liked by all, he will be sadly missed by all those who knew him. THERE ARE NO CHANGES TO THE PRICES FOR 2017- 31 AUGUST 2018 Menus and prices from September 2017. Your Secretary/Scribe E, etc.is the person to whom you should clarify the content and prices. Click this link>> To help the service in the bar, you may care to download and print this form. Can you please ensure that glasses, wine bottles etc are taken from the sprigs and tables after the Festive Board and put on the tables near the Kitchen doors. This will help Chris & Derek Childs to get them all back up to the bar for cleaning. Alan Harvey, a Director of Rochford Masonic Hall and Secretary of both Ashingdon and St Margarets Lodge has received an award from NHS Blood & Transplant Authority. He has received the highest (Diamond) award for giving 100 pints of blood. He has been a donor 52 years, since he was 18. Click on the blue link above for more detail. See attached for details of the above's results and date for the 2019 meeting. The Lodge is having a White Table meeting planned for 7th December 2018. We are meeting at the Rochford Hundred Golf Club 7.00 pm for 7.30 pm at a price of £26.00 pp. 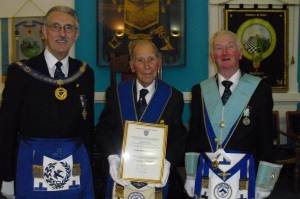 50 YEARS A MASON - TWICE! Click here to visit Stonewell Lodge's web site. Click here to visit Wickford Lodge's web site. Click here to visit Rochford Hundred Lodge's web site. Click here to visit Brownswood Lodge's web site. Click this link>> Bears in Rochford! TEMPLEWOOD LODGE'S BROWN FAMILY AFFAIR. How much History can you cram into one Lodge Meeting! TRINITY LODGE MAKE FURTHER HOSPICE DONATION. At the recent Trinity Lodge Ladies Festival the Raffle raised £350. Tom & Pam Wilson chose to donate the money to Havens Hospice, Westcliff. This is not the first time Trinity have donated to this worthy cause. This page, and any additional pages which may be required, are available for Rochford Lodges to post their News Items.